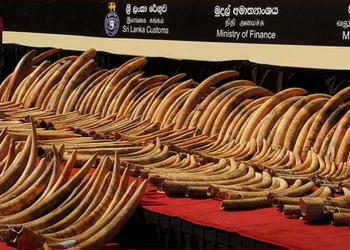 COLOMBO, Sri Lanka, January 26, 2016 (ENS) – Today, on International Customs Day, the Sri Lankan government has crushed more than 350 confiscated elephant tusks to destroy the value of ivory on the black market and to demonstrate Sri Lanka’s commitment to combating the illegal wildlife trade. President, Maithripala Sirisena attended the crush, together with ministers and diplomats, as well as John Scanlon, secretary-general of the Convention on International Trade in Endangered Species, CITES. The ivory was seized by Sri Lanka Customs in Colombo in May 2012 from a ship en route from Mombasa Port in Kenya to Dubai in the United Arab Emirates. From Dubai, the ivory was headed to Thailand before it was intercepted. Responding to a request from the Sri Lankan government, a team from the International Consortium on Combatting Wildlife Crime collected DNA samples from the seized ivory. Forensic analysis showed that the elephants had been poached in southeast Tanzania and northern Mozambique. Born Free USA and Born Free Foundation applauded the ivory crush. Born Free’s Country Representative for Sri Lanka, elephant scientist Manori Gunawardena, witnessed the destruction of the seized tusks. Gunawardena believes the event signaled a strong willingness for her country to combat illegal trade at the international as well as national level. “I am relieved that it’s finally happening and am thrilled at the buy-in from the president and prime minister. Sri Lanka is making a very strong statement by going ahead with the destruction with the support of the highest levels of government,” she said. “This event will educate Sri Lankans on the gravity of global wildlife crime and its impact on their country. Culturally, the Sri Lankan public will never condone the slaughter of elephants,” said Gunawardena. China, Kenya, Mozambique, Thailand, United Arab Emirates, and the United States all took a stand against illegal wildlife crime in 2015 by holding high-profile events to destroy ivory stockpiles. Earlier this month, Hong Kong revealed plans to ban the import and export of ivory and to close domestic markets. Based on Born Free’s monitoring of reports relating to ivory seizures, the group estimates that more than 139,000 elephants have been poached for their ivory since January 2012.
International Customs Day, January 26, organized by the World Customs Organization, recognizes the role of customs officials and agencies in maintaining border security by focusing on the working conditions and challenges customs officers face.